Jajpur(PTI): At least 43 heavy vehicles used in illegal mining of minerals were seized and over Rs four lakh collected as penalty in a crackdown in Jajpur district, an official said today. The seizure was during raids carried out by four district-leval teams against illegal mining activities in different places in the district yesterday, he said adding the vehicles were carrying sand, mourm, laterite stone and black stone illegally. The teams had conducted surprise raids at several locations under the jurisdiction of Barachana, Dharmasala, Jajpur and Sukinda tehsils, he said. “Four teams comprising revenue and police officials conducted surprise raids at different illegal mining areas under four tehsils. 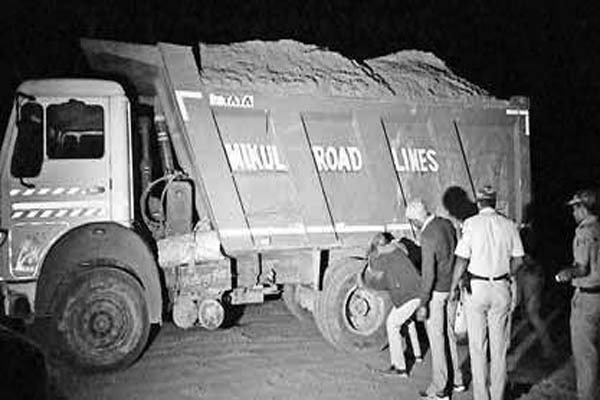 We seized 43 heavy vehicles including some tractors which were illegally carrying minor minerals,” said Jajpur district Collector Ranjan Kumar Das. The collector said the regional transport officer and the respective tehsildars had been asked to file FIRs against the mining violators. “The vehicles carrying minerals illegally have violated both Motor Vehicle and Mining rules. While RTO has been directed to lodge FIR against those violated MV Act, Tehsildars to file FIR against those who have violated Mining and Mineral Act with the local police,” he said. The collector has further directed the respective tehsildars to ensure halt to all illegal mining activities related to sand and laterite stone, black stone and morum in the district. The collector said several complaints regarding illegal mining activities were received from Dharmasala, Barachana, Korei, Jajpur, Danagadi and Sukinda areas. Das said he had visited some areas of the district where illegal mining was taking place. Jajpur Superintendent of Police Charan Singh Meena, Addditional District Magistrate Brajabandhu Bhola and Sub collector Narayan Chandra Dhal had also joined the teams which conducted raids, official sources said. laterite stone and black stone illegally.